Call (781)294-8155 for an appointment! We are proud to welcome our newest doctor, Caleb Birdwell, D.V.M. to our team! We strive to deliver the highest standard of compassionate veterinary care to every patient and personalized service to every client. When it comes to taking care of your furry little friend, don't risk entrusting their care to just any animal hospital. You need an animal hospital with a reputation for providing quality pet care. Our animal hospital is staffed by fully trained professionals backed by years of treatment and surgery experience. We are an animal hospital that truly cares about you and your pet. You need Halifax Veterinary Service. Halifax Veterinary Service knows that you and your pet deserve a clean, safe, and welcoming environment. Our highly trained staff works closely with you as a team in order to create the best care plan for your four-legged friend. We always keep you informed and take the time to answer any questions you may have. At our animal clinic, we strive to deliver the highest standard of compassionate veterinary care to every patient and personalized service to every client. 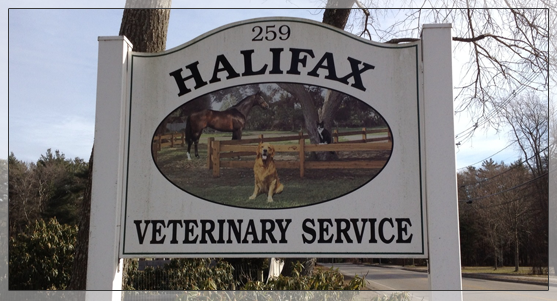 Halifax Veterinary Service is a mixed animal practice established in 1983 by Dr. Keith Hopkins. Due to our smaller size, we are able to provide each and every client with the individualized care you deserve. We know our clients by name and always greet you when you walk through our doors. Contact our animal hospital in Halifax, Massachusetts, to schedule an appointment today. We treat dogs, cats, small animals, horses, and ruminants.